Amaranth is one of the highly consumed vegetables in Indonesia because of its high nutrient content and low price. Like many other vegetables, amaranth is affected by diseases caused by microorganisms, insects, and other parasites depending on the medium it is grown in. For example, amaranth grown in hydroponics prones to suffer from damping-off disease, which is root rot caused by fungi. This disease usually occurs when water is not properly filtered and moving so that roots lack oxygen. Spread of the disease can be mitigated by early detection and removing the affected plants for the installation to avoid further contamination. Prevention, by ensuring a good supply of oxygen to the root systems, is also a good way to reduce incidence of damping-off. This can be achieved by fine tuning the hydroponic constructions to prevent water pooling. Recent findings have shown that chitosan, the polycationic form, can be used to effectively mitigate this problem. Chitosan is a polysaccharide synthesized from deacetylization of chitin in crustacean shells and available commercially in the forms of powder, paste, film, or fiber. This compound is used in agricultural, environmental, and pharmaceutical industries. It is shown to inhibit the growth of pathogenic bacteria and fungi, such as Fusarium oxysporum, Rhizoetonin solani and Phythium paroecandrum, a function that makes it ideal for agricultural applications. Furthermore, it also has been shown to improve plants defence against diseases. Based on these studies, PT. Indmira is developing a chitosan-based fungicide. Our study focuses on the seedling stage of amaranth. 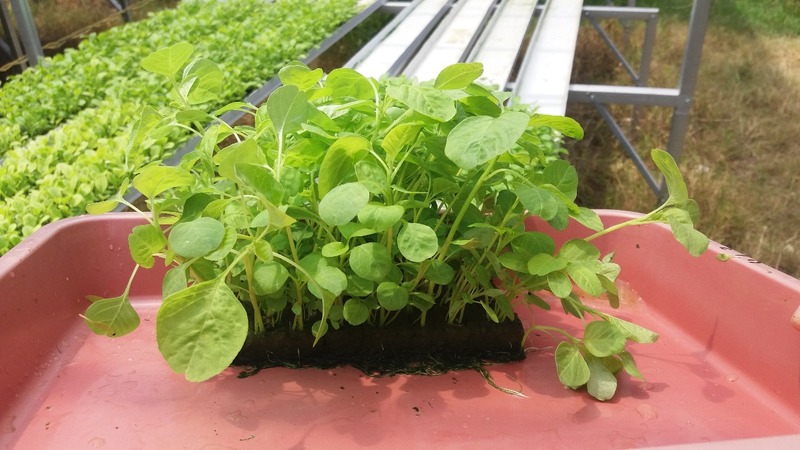 Amaranth seeds and seedlings receive chitosan solution spray everyday until they are transplanted in the hydroponic system. There are five experimental concetrations (in ppm) for the chitosan content at 100, 200, 300, 400, and 500. We also have two different concentration of acetic acid added in the solutions at 20% and 30%. The last variable is the additions hydroponic AB nutrient mix. The results show that the most effective solution to inhibit the fungal growth contains 500 ppm chitosan, 20% acetic acid, with the addition of A hydroponic nutrition. This treatment yields a 60% survial rate. The lowest survival rate is from the group treated with 500 ppm chitosan, 30% acetic acid, with the addition of B hydroponic nutrition. This study demonstrates that chitosan is very effective in preventing the damping-off disease in amaranth. This result provides a good foundation for further studies on the effectiveness chitosan in preventing fungal infections on other vegetables.